Well my easy Christmas nail series for 2014 comes to an end today with numbers 9 and 10 of the series. 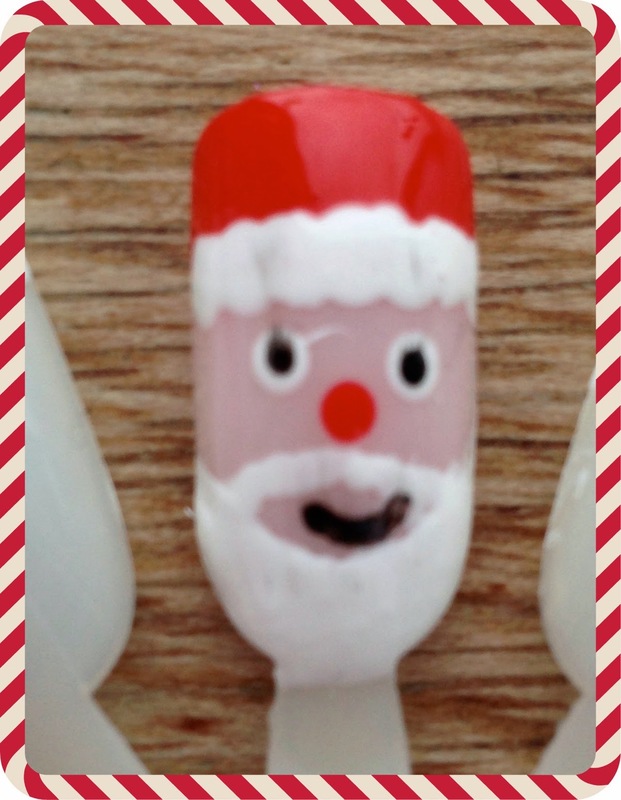 Number 9 is a 'festive french' look and number 10 is Father Christmas, although I stupidly didn't wait for the nail to dry fully before top coating and I smudged him :( you can still see the design though so forgive my dodgy looking Santa! So here goes with the final looks, first of all, number 9. 1. A pale pink polish for the base, I used Rimmel 445 Brit manicure. 2. A white polish, I use Barry M nail paint in white. 3. A red polish, I use Barry M bright red. 4. A green polish, I use Barry M spring green. 5. A silver glitter polish, I use Barry M silver glitter. 6. Dotting tools, I use ones from e-bay. 2. Apply 2 coats of the pale pink polish, allowing each coat to dry fully in between. 3. Apply 2 coats of white polish to the tips of the nail, allowing each coat to dry in between. 4. 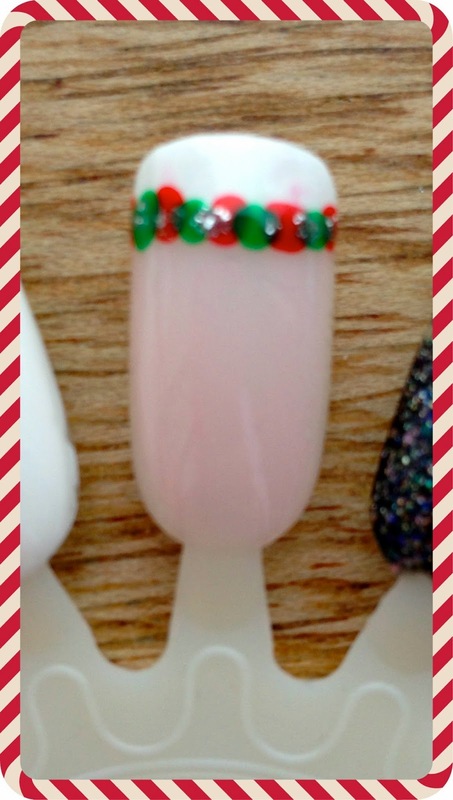 Using a dotting tool or cocktail stick/bobby pin and the red and green polishes, make dots in a line along the bottom of the white polish. 5. Once the red and green dots are dry, using the glitter polish and a dotting tool, place dots of glitter between the red and green polish. 6. Once the nails are fully dry apply a top coat of your choice. I think this is the look I am going to go for on Christmas day, it looks lovely, I did smudge a little as you can probably see but it is a lovely look and one that will look amazing on every nail I think or you could have a french manicure and do this look on the ring finger as an accent nail too. Keep reading for look number 10, Father Christmas. 1. A base and top coat of your choice. 2. A white nail polish, linked above. 3. A red nail polish, linked above. 4. A pale pink polish, linked above. 5. A black nail polish, I use Barry M nail paint in black, available for £2.99. 6. Dotting tools, linked above. 2. Using the pale pink colour, apply 2 coats allowing each coat to dry fully in between. 3. Using the red polish, paint the tip of the nail, use 2 coats of red allowing each to dry fully in between. 4. Using the white polish, at the base of the nail make a half moon shape to create the beard. 5. Using a dotting tool or cocktail stick/bobby pin create the moustache. 6. Using the white polish and a dotting tool create the white "fur"at the base of the hat, I use 2 coats. 7. Again using the white polish, make 2 dots for the eyes. 8. Using the black polish and a dotting tool or bobby pin/cocktail stick create the mouth and place 2 smaller dots on the white dots to finish the eyes off. 9. Using the red polish and a dotting tool, create the nose. 10. Once fully dry, apply a coat of your favourite top coat. How cute is he? Mine is slightly smudged as I said because I stupidly didn't let him dry before top coating, this is my very first attempt at Father Christmas nails and I worried it wasn't good enough to show you but since this series is for beginners I thought I would. I hope you like him. Both looks are nice and christmassy, obviously the Father Christmas is much more festive just because of what it is but I think they both look nice and again the Father Christmas can be used as an accent nail or on every nail. And that's it, that's the last in this years easy Christmas nail art series, I hope you've enjoyed the looks I created for you and if you do re create any of them, I'd love to see them so if you don't mind, please send me a picture of your creations :) I love to see them. Some of my photographs have looked blurry in this series, I apologise and this isn't something that has happened before, I am going to look into it and hopefully my photos will be clear from now on, I do hope it hasn't spoiled anything in this series for you. I've had a lot of fun doing this series and I hope you've had fun reading the posts too. I shall be back with another post soon but for now all that's left for me to say is, have a lovely Christmas and thank you for all your support over the last year, it means the world to me.